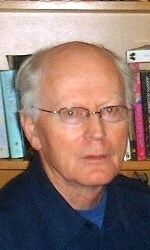 Gerard Rochford is a widely published poet living in Aberdeen. He has had poems in Lines Review, Poetry Scotland, Nomad, Cutting Teeth, Pushing Out the Boat, The Eildon Tree, Northwords Now and many other magazines, and is a featured poet on the American website Poets Against War. He has a collection Three Way Street, with Douglas W. Gray and Eddie Gibbons, and his latest collection is The Holy Family and Other Poems (Koo Press, 2005), a meditation on belief and disbelief. A founder member of Dead Good Poets, he convenes their monthly poetry readings in Books and Beans café/bookshop, Aberdeeen. Gerard Rochford's poem My Father's Hand has been selected by Janice Galloway for her Best Poems of 2006 list for the Scottish Poetry Library. Gerard was the guest reader in The Black Stilt poetry venue, Victoria, Canada, on Friday 13 October 2006.